While the development of the stock spring line cannot be pegged down to an exact date, we do know that it was not only developed before computers, but in fact, it was developed before calculators as well. That means, the designer, John Goodnow (an MIT Grad) designed the springs using hand-calculated formulas. John’s granddaughter recently told us that John, who lived in Scituate, MA, used to spend his evenings up on his second floor office doing the calculations for the stock spring line. With over 3,000 springs in the catalog, each having approximately 10 different formulas, one can only imagine how many evenings it must have taken John to complete the catalog! Now that we have the computers, we have subjected the stock spring line to computer verification, and we find that each of the designs is meticulously correct. That itself speaks a lot to John’s dedication and accuracy. Great work, John! Now that the stock spring line has been in existence for decades, we know that our stock springs have found their way into a multitude of applications ranging from manure spreaders to rocket ships. We know that they are used in medical devices, in tons of machinery, in air controllers in buildings, and in hoods that prevent germs from escaping. Even amusement parks have installed our stock springs in many of their rides. With this extensive catalog of stock springs, we have found another unanticipated benefit. Many times someone will design a spring for their own use and then find that one of our stock springs is quite close to what they are looking for. They can then purchase the stock spring at an amount that is quite a bit less expensive than the made-to-order spring they originally designed. Apart from saving money, they save on time as well because stock springs ship the same day if ordered during the first half of the day. We are also the only spring company in America that stocks hot wound springs as part of our stock spring line. Read our blog on hot wound springs and how to make the process of sourcing them easier. Our stock spring line is available in both carbon steel and stainless steel up to .125” wire. The rates indicated in the catalog are for carbon steel only. If you are looking at a stainless application, multiply the rates printed by 0.85 to get the stainless steel rate. For spring engineers out there, we know the appropriate conversion is .833 but we intentionally make our stainless stock springs to be 15 percent weaker than their carbon brothers or sisters. 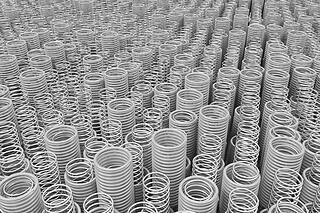 Take a look at our stock spring line and see if it suits your application.